The findings, published May 18 in the scientific journal PLOS ONE, point to development of a promising HIV treatment that could destroy the HIV DNA harbored in HIV-infected cells. Current HIV-AIDS treatments center on antiretroviral drugs that, when taken in combination for all of a patient's life, can prevent the growth of the virus but not kill or cure it. "For the first time, we show that it's possible with a systemic drug to selectively kill the AIDS-causing HIV-infected cells," said Hartmut Hanauske-Abel, a researcher from Rutgers New Jersey Medical School, a lead author of the study with appointments in the departments of Obstetrics, Gynecology and Women's Health; Pediatrics; and Microbiology, Biochemistry and Molecular Genetics. Treatment that targets the DNA in HIV-infected cells has been challenging because the persistent, incurable human immunodeficiency virus is able to insert its own DNA into the DNA of any infected cell while disabling that cell's ability to die to save other cells from a viral invasion. The researchers found that the oral drug, deferiprone, like the topical anti-fungal medicine ciclopirox that they previously studied, reactivates the "altruistic suicide response" of an HIV-infected cell, killing the HIV DNA it carries. The clinical pilot trial - conducted by the Toronto-based firm, ApoPharma Inc., which markets deferiprone - involved 26 consenting volunteers, both HIV-infected and healthy. Some participants received placebos, others the drug at two different doses. The authors cautioned that the findings do not prove that deferiprone in its current form is a safe and effective treatment for HIV. But the findings do provide researchers with ample evidence to pursue funding for larger clinical trials and to use the drug as a lead for future drug development, they said. The main function of this proof-of-concept trial was to learn that it is possible to have a drug that knocks down HIV and prevents its rebound. "The discovery raises the hope that HIV may not be able to develop resistance against this novel class of drugs," said study co-author Paul Palumbo of Dartmouth's Geisel School of Medicine. "It gives credence to the concept that like cancer cells, HIV-infected cells can be targeted and eliminated by a drug." Resistance commonly develops when treating HIV with widely used antiretrovirals. Despite the short, seven-day trial, deferiprone's effect on reducing HIV blood levels was similar to a multi-week treatment with AZT, zidovudine, an antiretroviral commonly used to treat HIV. The anti-HIV effect of deferiprone persisted after the drug was stopped - "an effect quite different from all current antiretrovirals," the researchers said. 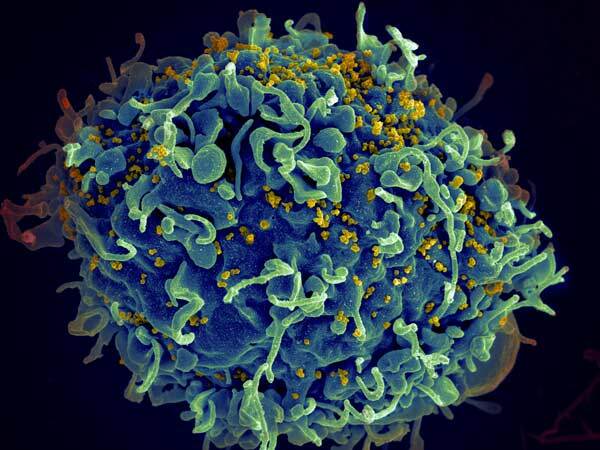 Regulatory guidelines for developing new antiviral drugs for HIV focus on inhibiting viral production and avoid using agents that kill cells that are actively or latently HIV-infected. That's why this group of researchers is focused on developing protocols for already approved drugs used for other medical treatments that show promise in eradicating HIV-infected cells, and on testing new combinations of those drugs for novel treatment protocols. Deferiprone, available for the past 20 years, is used in more than 60 countries to prevent death from blood transfusion-related complications during treatment of thalassemia, an inherited blood disorder in which the body makes an abnormal form of hemoglobin. The study published in PLOS ONE is the result of a 15-year research effort by the joint senior authors, Paul E. Palumbo, MD, of Dartmouth and Hartmut M. Hanauske-Abel, MD PhD, of Rutgers. They integrated university-, government-, and industry-based researchers from the United States and Canada in a combined effort to define the testable prospects of this novel treatment strategy for HIV-AIDS.